Bruisyard Hall is certainly what you'd call a large holiday cottage. In fact, Bruisyard Hall is so much more than a holiday cottage. 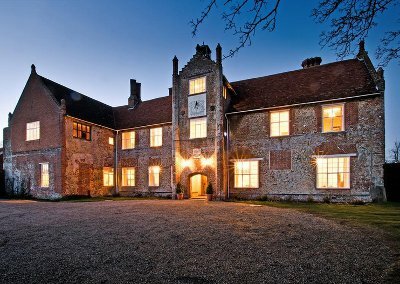 Sleeping 20 people in 10 bedrooms, Bruisyard Hall is set in 700 acres of Suffolk countryside. And with most of the bedrooms being en suite, Bruisyard Hall makes the perfect place for a getaway with friends and family. The 10 bedrooms at Bruisyard Hall are made up of 8 double bedrooms and 2 twin bedrooms; with 6 of these bedrooms being en suite. There is plenty of room around Bruisyard Hall too. The dining hall has a large oak table, and can easily seat 24 people. With the open-plan kitchen/dining room giving more than enough room to prepare a meal - and the two dishwashers will help you tidy away afterwards. A utility room provides the washing machine and tumble dryer. After dinner you can relocate to the drawing room, which has an open fire to sip your brandy in front of. Or how about a game of billiards in the games room? If you don't fancy that, the games room helps keep the children busy for a while. Outside, Bruisyard Hall is set in 700 acres - so you can walk the gardens like you're lord of the manor. When you want to leave the opulence of Bruisyard Hall for the day, there is plenty to see and do in the area. Framlingham is just down the road, where you can visit the castle. Or head eastwards towards the coast. Thorpeness has a tea room and large Meare to hire a row boat for an hour. Aldeburgh is a mile south of Thorpeness, and has world famous fish & chips. heading north along the coast, you can visit Walberswick and Southwold - Southwold in particular is well known for its pier. The county town of Ipswich is a few miles south from Bruisyard Hall; or stay local to the hall and take some time to enjoy the countryside on foot or cycle. One last place to mention is "Sutton Hoo", which is an Anglo-Saxon royal burial site - and well worth a visit.